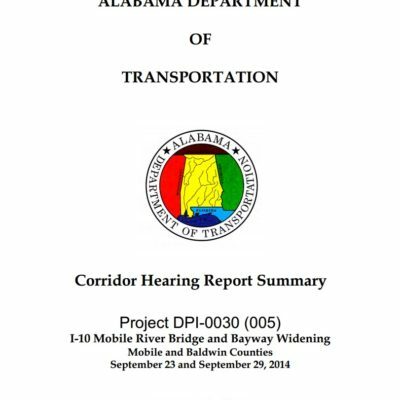 On January 9th, 2015, the Alabama Department of Transportation (ALDOT) released the Corridor Hearing Report Summary for the proposed Mobile River Bridge and Bayway Widening Project. The eight page document provides a brief synopsis of the public hearing process and the comments received during the 45-day comment period. ALDOT received 641 comments from the public regarding the proposed project during the official comment period, which ran from September 23rd to November 7th, 2014. Of those that provided comments, 558 (87%) were in favor of the project, 40 (6%) were not in support of the project, and 43 (7%) did not specify either way. In addition, 556 people attended the two public hearings held on September 23rd, 2014 at the Alabama Cruise Terminal and September 29th, 2014 at the Five Rivers Delta Resource Center. Based on the comments received, ALDOT recommended further study and development of the preferred alternate “B Prime” in the Final Environmental Impact Statement (FEIS). The report also recommends further study of the inclusion of bicycle and pedestrian facilities across Mobile River. With the recommendations, ALDOT has announced that the preliminary design process for the project may begin. This design is necessary to finalize mitigation plans and assist in determining a more detailed project cost, which will be included in the Final Environmental Impact Statement (FEIS). The FEIS is expected to be completed within 1-2 years and its release will be followed by a Record of Decision. Thank you to everyone who attended the public hearings in September 2014 and provided your comments. It is exciting to see this process move forward.